This year, we have a lot to be thankful for. Each day at Nyhus, we have the opportunity to support our clients and each other, as we work towards a variety of personal and professional goals. 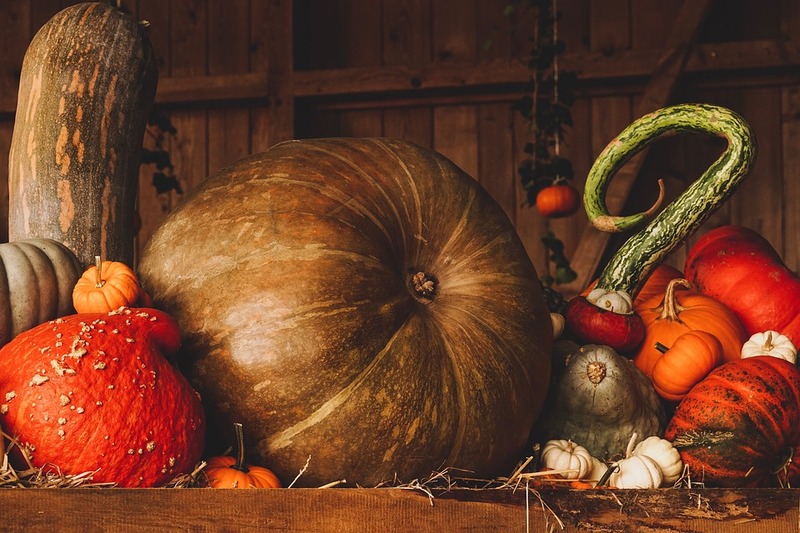 As we prepare for the holiday and enjoy some time with our friends and family, we’re taking a moment to reflect on our favorite traditions that fall (pun intended!) during this time of year. 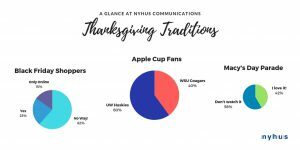 On Friday, November 23, the University of Washington Huskies and the Washington State University Cougars will meet in Pullman at the beloved Apple Cup. At Nyhus, it’s probably best that we don’t watch the traditional Washington game together, as we appear to be a house divided. 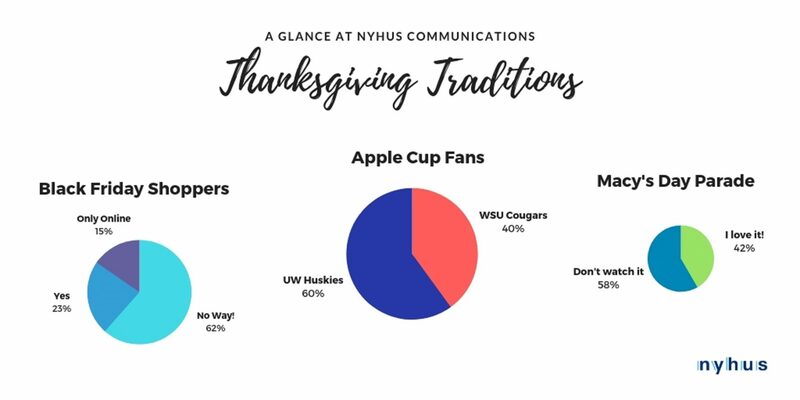 Overall, 60 percent of us at Nyhus are Husky fans, while the other 40 percent root for the Cougars. Jane Nellams, administrative assistant and “office mom,” opts out of the Apple Cup altogether, instead rooting for the University of Oregon Ducks in the Civil War match up against the Oregon State Beavers. Though I’m clearly biased, I will always argue that my father makes the best green bean casserole. While this is a staple on most Thanksgiving dinner tables, there are a few unique dishes that our team enjoys this holiday. Account Executive Veronica Brown looks forward to her grandma’s cranberry Jell-O salad each year while Jane Nellams bakes a homemade rum apple crisp for dessert. A few other favorites? Our fearless leader, Roger Nyhus, favors candied yams, while Account Coordinator Ian Hanson loves crescent rolls. Jason Yormark, director of digital strategy, loves his wife’s mashed potatoes and gravy, while Katherine Mackinnon, account supervisor, can’t get enough of Norma’s broccoli casserole. Other staff favorites include stuffing, pecan pie, turkey and pizza. Personally, I’m hoping to get the chance to taste Executive Assistant Ioanna Antonopoulos’ homemade cranberry sauce! Curious about our unique family holiday recipes? Check out our 2016 blog post for a full breakdown. While food is always an important part of Thanksgiving, our team most appreciates the down time and special moments we get to spend with our families. Account Supervisors Gina Maffei and Katherine Mackinnon spend their holiday playing card games and doing puzzles with relatives as the turkey cooks. Vice President Karen Johnson enjoys cooking her mother and grandmother’s (or Omi’s) German holiday recipes. Jason Yormark and Vice President Marc Berger prefer watching football, while Account Manager Mike Gilmore looks forward to the inevitable after-turkey nap. After the big holiday, COO Heidi De Laubenfels and Account Supervisor Amy Snow Landa prefer to get outdoors to hike and go snowshoeing with their families. Personally, my favorite way to wrap up the holiday is with our ceremonial family viewing of our favorite Christmas movie, Elf! What are your family’s Thanksgiving traditions and recipes? Shoot us a note and share your favorites with us!